Here at WGM we love Hip-Hop, but we also love music in general and do have that punk music side in the Giant. The same way that Hip-Hop has a raw spiritual life energy to it, I also think punk has it as well. Yes punk is noisy (As it should be), and for most people it's VERY annoying, but it speaks to the listener and most are able to relate to it's words just like Hip-Hop. It isn't about the glamor (we're not talking that radio Pop-Hop), but life and what we go thru. Sometimes punk can be a little harsh or overboard as some say, but who's to say it's wrong or bad when it's about human emotion. You can't really say it's wrong just because you don't feel the same way... right? 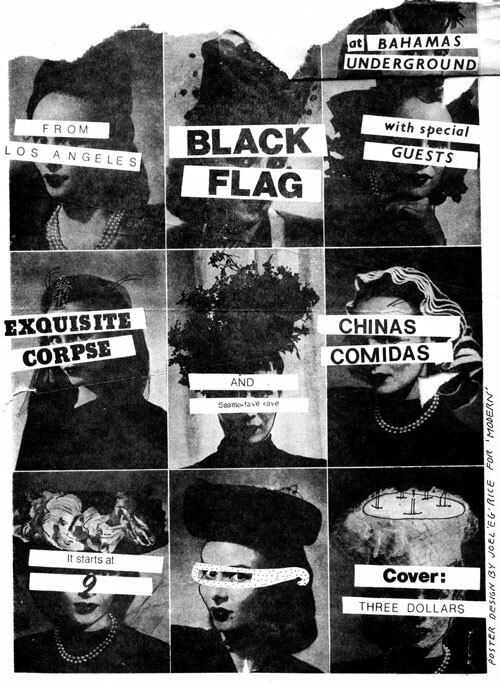 Below is a flyer from one of the greats and believers of the DIY attitude in music promotion... Black Flag, from one of the best years ever '79. Henry Rollins spittin and stompin and marching to the angry tune of mental, political, and life issues was and is one of the best. Fists in the air, guitars wildin out, people loosing their minds. "Society's arms of control. Rise above, we're gonna rise above. Think they're smart, can't think for themselves. Rise above, we're gonna rise above. Laugh at us behind our backs. Rise above, we're gonna rise above. I find satisfaction in what they lack. Rise above, we're gonna rise above. We are tired of your abuse. Try to stop us, but it's no use." Ah ah ah ah I want the knife... Please!